At first glance, the M46 looked almost identical to the previous M26 Pershing, main US Heavy tank at that time. Both the M26s and the M46s were reclassed later as Medium Tanks, and properly speaking the last heavy tank ceased to exist after the only heavy tank battalion equipped with the mediocre M103 was deactivated in 1960. The “Main Battle Tank” denomination was adopted much later for the successors of the M46, the M47 and moreover the M48 and M60s because at that time the light tanks developed in parallel (like the Walker Bulldog and later the Sheridan) were considered almost as auxiliaries. So in a sense, the M46 could be traced back as the first American MBT and was also the first to bear the name of US history’s most famous tank general. 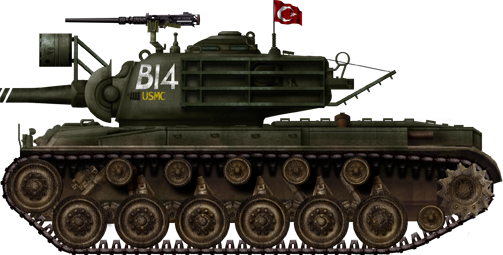 The M46 was designed after the M26 Pershing showed in action some issues that needed to be fixed, but moreover as an attempt to replace also the M4 Sherman. This “universal tank” was expected to fuse both classes in a single package. The low speed of the M26 was a drawback while at the contrary the M4 showed tremendous speed and mobility but lacked protection and firepower alike. These issues were at the core of the engineers thinking at the Detroit Arsenal Tank Plant. At first, they chose the easiest way as to just modify and upgrading the existing M26. Their work was dictated by the need to decrease the overall hull weight without significantly weakening the protection, and also re-engineering it with a more powerful engine and more reliable transmission. So after some testings, the Continental AV1790-3 was adopted. It was capable of more than 800 hp (the M26 Ford was rated for only 500 hp), and was coupled with the cross-drive transmission Allison CD-850-1. This prototype, first built and tested in 1946 as the M26E2 was followed by many modifications. In 1948 the ordnance bureau decided to rename the sum of all these modifications under a new model: The M46, a reconversion for the existing M26s. The M46 had some specific external features, but the real revolution was mostly internal. The most obvious difference was the new engine, which dictated a “stretched” rear engine compartment by a foot. The drive sprockets were raised and relocated much more rearwards, which imposed to add compensating idler wheels on the tracks as tensioners. The turret was almost unchanged while the main cal 50 machine gun was relocated to the front, to an armored cover above the gunner’s primary periscope sight. The design of the engine deck and exhaust vents were also completely changed in accordance with the new engine. Other changes included rear fender mufflers with shield and a bore evacuator with a smaller SBMB on the main gun. In all, 800 M26 were converted to the M46 standard by November 1949 to the end of 1950 at Detroit Arsenal. By 1951, the M46A1 main external modification concerned the new 90 mm barrel fitted with a reshaped muzzle brake, bore evacuator and single baffle muzzle brake with internal compensator spring to reverse the muzzle exhaust and further reduce the recoil. This allowed a much more powerful ammunition without large changes to the internal turret layout. Internal modifications included improved braking, improved cooling and fire suppression systems, and enhanced electrical equipment. There also received the new AV-1790-5B engine and an upgraded CD-850-4 transmission. This version was traduced by the conversion of 360 more M26s, giving a grand total of no less than 1160 Pershing conversions into the M46/M46A1 standard. By the time North Korea invaded, US forces counted a large assortment of aging ww2 models, ranging from various M4 Shermans (the latest being the M4A3(76)W HVSS or “easy eight” (M4A3E8), well used in Korea), the heavy M26 Pershing and light M24 Chaffee. So the freshly converted M46s were welcomed and their metal was to be soon tested, at first with the 6th Tank Battalion which landed on 8 August 1950 in South Korea. By the end of the year, nearly 200 were operational in this theater, and they proved all but superior to the few T-34/85s encountered, while 309 M26s were also present. But this proportion rose as more M26s were withdrawn and replaced by newly arrived M46s, also gradually replacing M4 Shermans by 1951. Operators included (in 1951-52) the 1st Marine Tank Battalion and some regimental Antitank Platoons of the 1st Marine Division, but also the 6th, 64th, 72th, 73th, 140th, 245th tanks battalions attached to various infantry divisions and some regimental tank companies of the 40th Infantry Division, and in 1953 with the 7th and 65th Infantry Regiments. The only known variant -outside the M46A1- was the “Dozer” version equipped with an M3 bulldozer kit. Only three countries were known outside USA to operate the M46: Belgium, France and Italy, which received small numbers of M46s for training (crews and maintenance teams) to prepare the M47 arrival. Propulsion Continental AVDS-1790-5A V12, AC Twin-turbo gas. 810 hp. M46 Patton early production, with side skirts, from a home unit, USA 1949. M46 from the Company B, 6th Tank Battalion near Lunho, Korea, september 1950. M46 with a “brass-saver” basket and 1.8 in searchlight from the 1st USMC in support to the Turkish brigade, Korea july 1953. M48 during the winter 1952-53. Side skirts on almost all M-46s serving in korea were discarded. This “tiger” paint scheme was used only in operations Ripper and Killer, April-May 1950 in Korea by American Army units only. It was psychological ploy based on the Chinese superstition and fear of tigers and dragons. M46 from the company D, 1st USMC battalion, with an anti-bazooka screen and possibly a “brass-saver” basket, Korea 1953. It was M26E2,M26E1 was M26 with T54 main gun. After checking with Hunnicutt, we have determined you are correct! The changes have been made! Interested in deterring model of M47 Patton I drove as kid , (16,17) IN. National Guard 1948-50. Tank had 90MM with muzzle break, 30cal coax equipped with 2 500 hp Ford Engines and Chrysler auto transmissions ? Join Navy July 1950 , wasent too keen on going to Korea in a tank! Served in Korea 50-51 Aircraft Carrier. I lived in an M46 for a year in Korea (52’and 53′) with A-T Company, 5th Marines. It was an excellent tank with a great gun. By that time the Chinese had stopped using tanks, at least I never saw one, and Korea was lousy tank country anyway. We were pretty much line-line-of-sight artillery. The problem with that was that if you could see them, then they could see you. Got hit twice by battery-fire artillery, but only one casualty. Trained in the states in M4A3 with a 105 howitzer. Glad I didn’t have to serve in one in Korea. It was a death trap, as they found out in WWII. Great information, thanks for sharing Pierre.